As a musician, Frank Zappa liked to push the established boundaries and challenge traditional ways of doing things. When done right, this style can really rock for you. Shave or closely trim your cheeks, chin, and neck, while leaving the mustache and Soul Patch beneath the lower lip untouched. 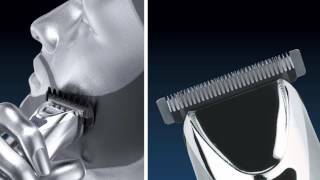 With your Wahl® trimmer, square off the mustache, allowing it to extend a half-inch to an inch beyond the corners of the mouth. Keep the ends of the mustache a bit longer for a downward finish. Using your trimmer, shape the whiskers beneath your lower lip into a square or rectangle that extends approximately one inch towards the chin. Wahl offers trimmers and grooming kits that let you achieve the look you want and keep it looking great.